Cantemerle’s new proprietors believe in producing delicate, beautifully wrought, finesse-styled wines that require some introspection. The deep ruby-hued 2005 displays aromas of licorice, roasted herbs, sweet cherries, and flowers. In the mouth, the wine seems almost light in comparison to its peers, but it possesses an ethereal seriousness, purity, and overall harmony that are striking for its delicacy and finesse. A blend of 61% Cabernet Sauvignon and the rest primarily Merlot with a tiny dollop of Cabernet Franc, it should be at its finest between 2012-2025+. This is a great 2005. 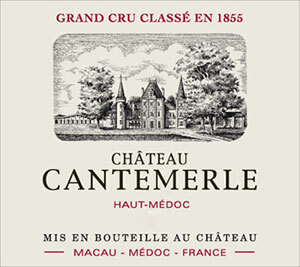 The Cantemerle is developing a very attractive, lifted nose with more cedar and crushed stone, hints of freshly rolled tobacco and briary. The palate is medium-bodied with firm tannins, gentle grip, leading to a foursquare but precise finish that does not dare put a foot wrong. Sedate at the moment but sure to open up with time. Classic Bordeaux. Tasted July 2011. Tasted single blind at Southwold. This seems very closed on the nose, but with aeration eventually reveals some attractive, classic cedar aromas with good definition. Understated on the entry, but the mid-palate displays some firm tannins, notes of blackberry, tobacco and black plum, then a sharp, edgy finish. Not quite as thrilling as its primeur showing but returning after a few minutes, the wine seems to be opening up and so I would certainly give this 5-7 years to show its true potential. Drink 2012-2025. Tasted January 2009.